A songbird that's a raptor! Loggerhead Shrikes are found across much of the United States in open country, like pasture and sagebrush. 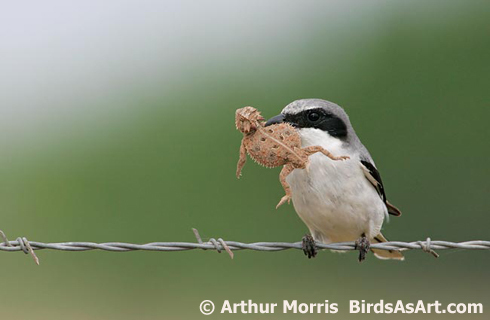 Male shrikes are well known for impaling their prey on thorns, creating a larder that may help impress potential mates. But pesticides and the loss of habitat to residential and commercial uses have reduced shrike populations. Conservation efforts are under way, such as allowing brush to grow along fence-lines, leaving small trees and shrubs on the roadside, and reducing or eliminating the use of pesticides. In the blink of an eye, a bird of prey plummets to the ground, pinning an unwary mouse. A moment later, it flies off, clasping its prey in its feet. A familiar drama we expect of a hawk or falcon or, after dark, an owl. But this bird of prey is a songbird, a bit smaller even than a robin. It’s a Loggerhead Shrike. Silver-gray with black wings and a vivid black mask across the eyes, shrikes look like bandits [Loggerhead Shrike song]. This impression is reinforced by the shrike’s large head and hooked bill. Male shrikes are well known for impaling their prey on thorns, creating a larder that may help impress potential mates with their hunting prowess. Loggerhead Shrikes are found across much of the United States in open country, like pasture and sagebrush. But pesticides, and the loss of habitat to residential and commercial uses have reduced shrike populations. Conservation efforts are under way, such as allowing brush to grow along fence-lines and leaving small trees and shrubs on the roadside. Reducing or eliminating the use of pesticides can also help sustain this tough customer among the songbirds. Sounds of Loggerhead Shrike provided by The Macaulay Library of Natural Sounds at the Cornell Lab of Ornithology, Ithaca, New York. Singing 8979 recorded by G.A. Keller; scolding 44849 by G.A. Keller.